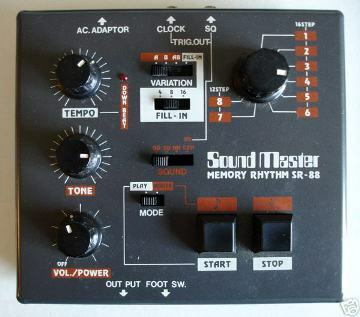 Sound Master Memory Rhythm SR-88 drum machine 1-page advertisement from page 67 in Keyboard Magazine August 1982. Hmmm. Not sure how I feel about this ad. There just seems to be a lot going on. "The SR-88. Another innovative product from The Rhythm Section by Sound Master Distributed exclusively by JTG of Nashville." So, let me get this straight. JTG of Nashville is the distributor of the SR-88 which was created by The Rhythm Section which is somehow owned or operated by Sound Master. That is waaaaay to much information. Sounds like something political is going on there, and readers unfortunately get stuck in the middle of it. There also seems to be a lot of ad-copy which actually doesn't give me much information. Reason #4 gives readers the most info including instant stop/start, variable tone and output switches, and a write/play mode indicator. The most I glean out of the four other reasons put together is: 16 rhythms, clock pulse and a price of under $200. The actual specs that are probably most important to potential buyers are inexplicably shoved into the bottom right-hand corner. Luckily for me, there are a few resources on the Web with more information about this beast. Unluckily for blog readers, as soon as I started looking for more info, I got swept up in a certain SR-88/Boss DR-55 controversy. One of the first Web sites I hit while looking for info on the SR-88 was Dubsounds.com. 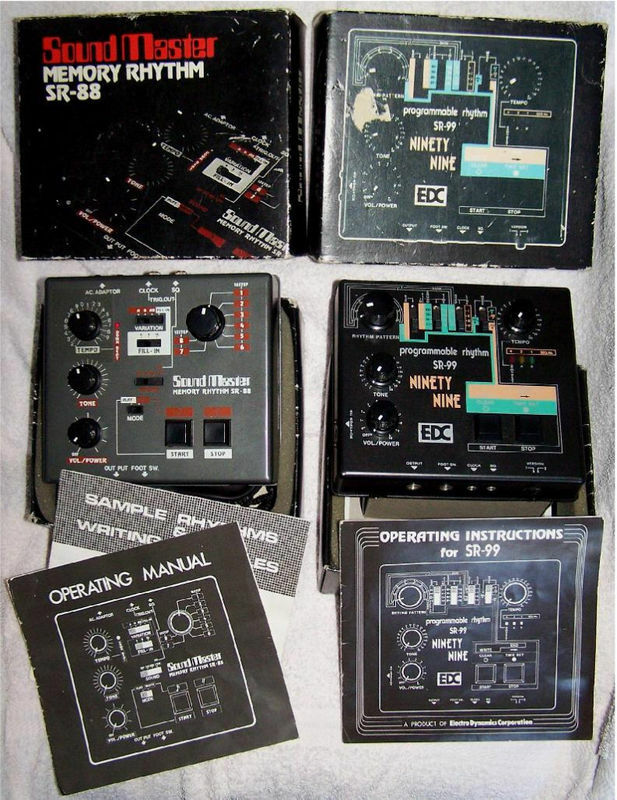 The site includes a great little write-up on the SR-88, but, more interesting was finding out about a little controversy about whether the SR-88 or the very similar Boss DR-55 came out first. The two do seem mighty similar in functionality. For comparison purposes, I did a quick search on MATRIXSYNTH to find more photos. . A great photo of a gray SR-88 can be found in this December 2005 SR-88 MATRIXSYNTH auction post and the less common, but definitely more cool, blue SR-88 can be seen in this January 2011 MATRIXSYNTH auction post. "Interesting. I have an Amdek RMK-100 (sold as kit), very similar!" Never heard of it, so I Googled "Amdek RMK-100" to see just how similar it was to both the DR-55 and the SR-88. Turns out (according to the Internet) that Amdek products were made by Boss/Roland back in 80s, and, not only that, but that the RMK-100 is actually the kit version of the Boss DR-55. Makes sense on why it would also be similar to the SR-88. 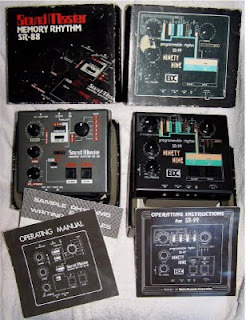 I found an ebay auction for an Amdek RMK-100 going on right now with a great photo of the front panel (see below), and indeed it does share a lot with the DR-55 and SR-88 - but definitely not identical to either one. For example, it looks like the Amdek and SR-88 share a similar filler function that as far as I can tell is not available on the DR-55. And the DR-55 and the RMK-100 share a similar accent function that I don't see on the SR-88. Now where does the Electro Dynamics Corporation Programmable Rhythm SR-99 fit in? 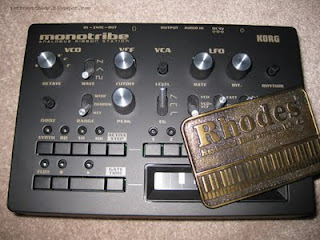 I also came across another machine with similar features - the Programmable Rhythm SR-99. No - not manufactured by Sound Master, but by Electro Dynamics Corporation. And, it too resembles the others in functionality, and especially the SR-88 in design also. I've included a row of photos below to help make the comparison between the two. The SR-88 photo is from the 2005 MATRIXSYNTH auction post and the EDC SR-99 photo is from the excellent BigBlueWave.co.uk site. I've also thrown in a photo from another recent E-bay listing that included both - plus boxes and manuals! Sick! Obviously, Sound Master and EDC are somehow connected, although I can't find any info on the Internet concerning these two companies. I do know that they were both advertising separately in Keyboard Magazine in late 1983, making it unlikely that one of the companies changed their name to the other. Anyone know anything? "This is essentially a fully expanded Boss DR-55 feature-wise and tone-wise. The circuits are identical (schematically and tonally) to the Boss DR-55, but the Clef Master Rhythm gives you way more instruments than the Boss DR-55..."
Interestingly, according to the post, it pre-dates the Boss DR-55 - and also came in a kit form like the Amdek. 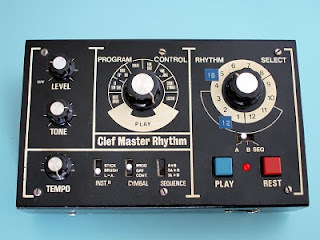 "The Clef Master Rhythm came out a little before the Boss DR-55 in late 1979/early 1980. It was sold in two versions and available in greater quantities in Europe than in the United States. One version was a kit that the user put together and another one was a prebuilt machine." So, looking at all five machines, its almost like there was a rhythm machine salad bar of some sort in Japan, and each company stepped up to it and picked out which features they wanted to include in their product. And that begs the question - since we know there was a kit form available and there are claims that the Clef Master even has the same circuits as the DR-55, could all five products (and probably others) have used the exact same internal parts - each company choosing which features to include and then customizing in their respective rhythm machine? And if so, were those parts supplied by Amdek, or did all five get their internal parts from some other manufacturer? And if that is the case, then the question of whether the SR-88 or DR-55 came first doesn't really matter much, since it is likely that the kit components would have been available first. Plus, we have that one auction post with the claim that the Clef Master came out before the DR-55 - making it all even more confusing to figure out. 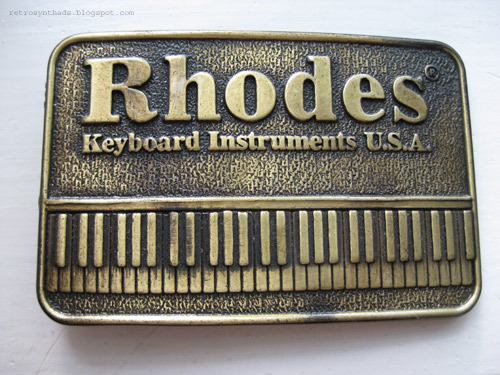 Rhodes Keyboard Instruments U.S.A. belt buckle from approximately 1979. While I'm getting acquainted with my new Monotribe (weeeeeee! ), I thought I would post something short and simple - and figured it was about time I posted another belt buckle from my collection. 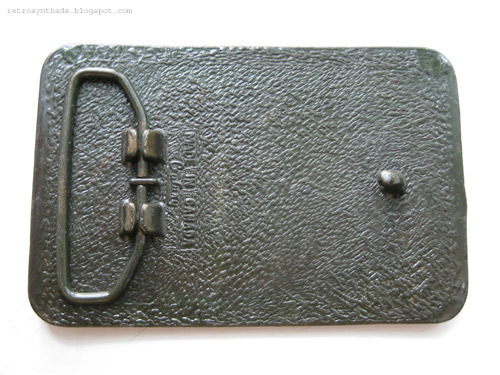 One of the coolest things about this buckle is that it was made in Canada by Century Products Ltd (engraved on the back of the buckle). Unfortunately, there is no date on the buckle, but it was given to me along with a few other belt buckles (including the ARP buckle), and was told it came from around the same time period (1977-83). I have no reason not to believe this. I haven't bothered to research this logo too much to see if it fits the time line, but I did come across a Rhodes Keyboard Instruments USA service manual scan (PDF link from vintagevibe.com) that includes this exact logo along with a 1979 date. So... 1979 it is! If you know different, please email me! Electronic Dream Plant Wasp "skinny" 1/3-page advertisement from page 56 in Contemporary Keyboard May 1979. I recently blogged about how EDP's Wasp introduction in North American wasn't exactly a big deal. Especially when you consider how it was introduced in it's home country across the pond with a large full page advertisement along with a full review of the synth. Luckily, it turns out that EDP had bigger plans for Contemporary Keyboard - it was just going to take a couple of months. After that first rather unknown tiny ad turned up in the February 1979 issue of Contemporary Keyboard, there came a month without a word from the company. Then, EDP, or more likely their exclusive distributor for the Americas - AIM Limited (Bob Gross) - got their act together with the more well known full page "yellow" advertisement in April 1979. That full page ad appeared just one more time in July, but in between those appearances, AIM decided to run this condensed 1/3-page version of the ad in May and June. And surprisingly, managed to fit EVERYTHING except the list of resellers. The color of the ad is what really makes it stand out. If you are flipping through CK, that flash of yellow immediately gets your attention. And, since they were trying to squeeze so much information into such a small space (both for the full page version and the skinny version), they were smart to put the image and the price at the top (and top left) of the ad. I never did know much about the Wasp, or EDP, so I went searching on YouTube for a demo and came across a great video for an E-bay auction. Turns out, its the same Wasp that I referenced in my previous Wasp post concerning the British flag. Interestingly, the seller updated the description of the video with the final price of the auction - and it looks like this Wasp sold for only $687! Great deal for whoever got it. 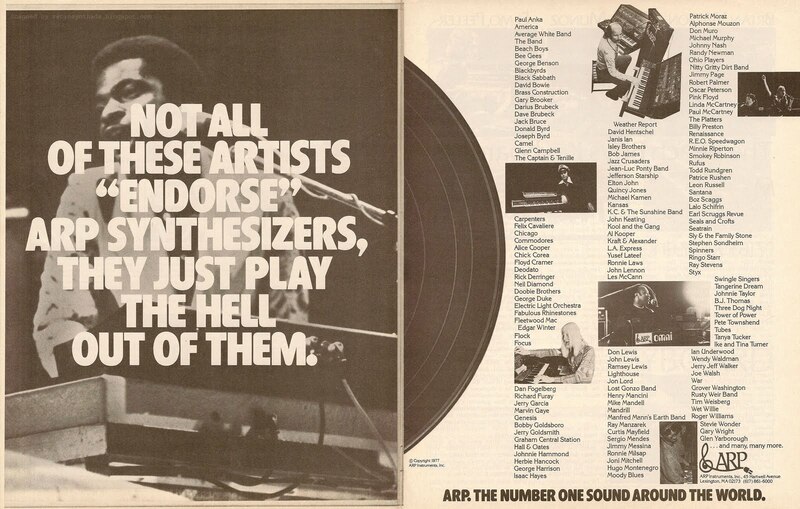 ARP "Play the hell out of them" 2-page endorsement advertisement from page 16 and 17 in Contemporary Keyboard July 1977. Sometimes the name dropping wasn't really official. For example, in the Moog Satellite reference sheet that mentions Goodman and Davis, I doubt these artists are endorsing the instrument. Instead, Moog is just strategically making the connection between the artist, the instrument, and most importantly, the reader. But, let's face it, ARP was the ultimate name-dropper. It was a legit part of their ongoing marketing campaigns. To give you an idea of how ingrained endorsements were to ARP, you just have to look at ARP's Wikipedia page and that long list of "Notable Clients" that today's Wikipedia contributors have made the effort to include there. Other companies like Moog had many notable clients back in the day as well, but it just wasn't as in-yer-face. The result was that it didn't become such a big part of what made Moog who they were, and so Wikipedia contributors have not made the same effort to include a big long client list on Moog's Wiki page. Hmmmm - not sure that thought translated from my brain to the post well... hope it made sense. Not all of these artists "endorse" ARP synthesizers, they just play the hell out of them. Awesome. And, to really make sure ARP is associated with the rocker elite, they throw in a naughty word while they are at it. 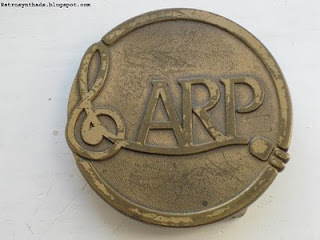 ARP. The number one sound around the world. Arguable, but I'm a little biased towards Moog. The design of the ad itself is also impressive with the way the first page looks like an album cover with a record sliding out onto the second page. It's a nice effect and ties in well with the musician's list. Hmmm. Seems I've run out of things to say. Good thing too, because I'm on vacation, and just got invited to a weiner roast. Yum. I hope there's a frisbee. End note: whenever I see that photo of Captain (from the Captain and Tenille), I can't help but think of Hefner wearing his captain's hat. Is that wrong? 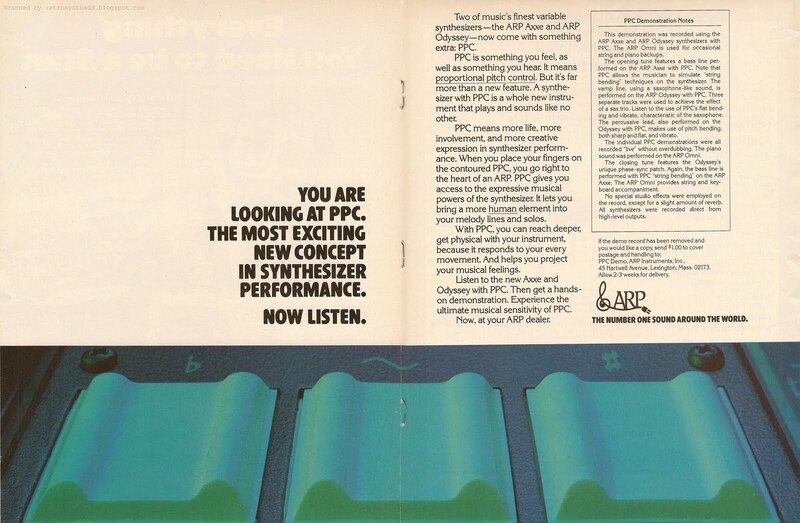 ARP "Proportional Pitch Control" 2-page introductory advertisement from page 32 and 3 in Contemporary Keyboard September 1977. Update: Added to the ARP advertising timeline tool. This post is kinda special for me because it's the first time I've recorded a sound sheet and posted it on SoundCloud. Change is good, right? RIGHT? Exciting times! Anyways, I'm getting ahead of myself. ARP loved their demo records. Sure, other companies at the time also used them - but I kinda look at ARP as one of the leaders. Their earlier (and heavier) vinyl demo records are a little annoying because they didn't often have dates printed anywhere on them as far as I can tell, although there are obscure code etchings in the lead-out section of most of the records which probably refers back to a date in some recording engineer or vinyl record presser's ledger somewhere. All I know is that this makes it kind of a pain when I want to line up a record with a synth launch or advertising/promotions campaign. When everyone and their pet dog switched over to those flexible Eva-Tone sound sheets, dating the pressings got a little bit easier later on, when at some point in the mid- or late-70s, Eva-Tone started to include a date code above their name. So, for example, the Eva-Tone sound sheet attached to this centerfold advertisement includes the code 67771XS. The first four numbers are apparently the production date - in this case June 7, 1977. Side note: Friend of the blog Micke let me in on this Eva-Tone date code - thanks Micke! This June production date is historically interesting because it helps us with the time lines for ARP's Proportional Pitch Control. 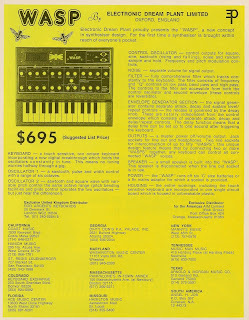 We know that this September '77 ad is the introduction of PPC, but we also know PPC was functional and making live appearances as early as June '77 since it was included in this Summer NAMM ARP brochure. And now we have this recording, also from June '77. Which means the recording of the record, and thus the functionality of PPC, might have been available as early as May or April even. Excellent stuff! This 2-page centerfold advertisement is quite impressive, with the close-up shot of the three PPC pressure pads that span the bottom portion of the two page spread. Two outer pads bend notes flat or sharp, and the middle pad provides vibrato. Cool technology added to both the Axxe and Odyssey. The ad-copy is mostly marketing hype and doesn't really explain much about PPC. Luckily, the "PPC Demonstration Notes" call-out box next to the ad-copy does a bit of a better job of explaining how PPC works. And that call-out box also provides us a lot of interesting information about the sound sheet recording itself. As I mentioned above, this is my first audio recording attempt (for the blog :) - and I've used SoundCloud since all the kids seem to be hanging out there now. My sound sheet came with a few scratches, which you can really hear during the quiet parts. But give it a listen anyways - and enjoy! Someone needs to sample that record. Stat! End note: Interestingly, while researching this post, I found ARP NAMM promotional info in the "What's Happening" section of the May/June issue of Synapse, but, unlike the ARP NAMM brochure, the "What's Happening" blub only makes reference to the guitar synthesizers - and not PPC at all. "ARP Instruments has announced the unveiling of two guitar synthesizers at the Atlanta NAMM convention in June. On display will be the production prototypes. There is no date yet for their commercial release, but Synapse will let you know more about them as soon as we can. Anyways, I've added this bit of info to the ARP NAMM brochure blog post as more proof for the appearance of the Centaur and Avatar prototypes at the show. 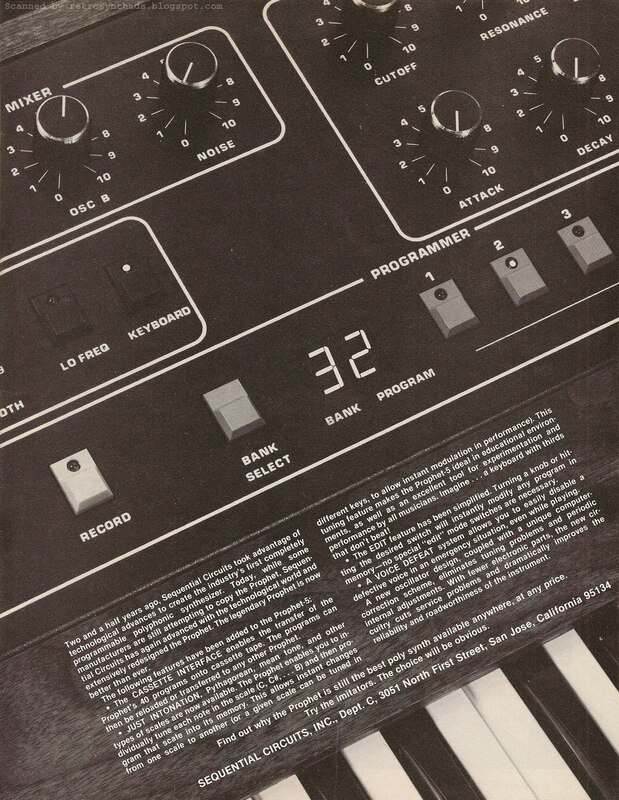 Electronic Dream Plant Ltd. Wasp synthesizer introductory 1/12th-page advertisement from page 52 in Contemporary Keyboard Magazine February 1979. Man - what a great summer! Almost forgot to post my blog today! We have our corporate picnic today, looking forward to it. Two words: cotton candy. Okay... one short blog post (for one short ad), coming right up! Not really the same big splash of an introduction that was seen across the pond. 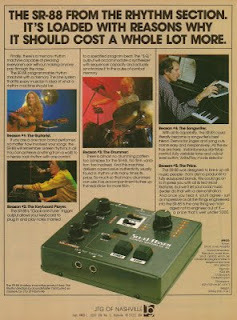 That one included both a full-page advertisement AND a review of the synth. Nope - this little addy barely has room for the photo - so readers will find no actual useful information - no price, no functionality, nothing. Boo. Luckily, this same issue of CK happened to include the Spec Sheet for the Wasp - and, what I believe is the exact same photo. It includes all the reference information you can shake a stick at, including US price! And you know how much I love Spec Sheets! "Wasp Synthesizer. The Wasp features two audio oscillators, an LFO, a multimode filter, two envelope generators, a noise source, a two-octave keyboard, and a built-in speaker. the audio oscillators are full-range analog/digital hybrids, with sawtooth and pulse wave-forms. The LFO has square, sine, positive-going and negative-going sawtooth, noise, and random sample-and-hold functions. It can control both the oscillators and the filter. A control is supplied for adding the LFO into the filter in both positive and negative forms. Six C batteries or a 9-volt adapter can be used to power the unit. The keyboard is a touch-plate that works off of capacitance. The envelope generator can be set to repeat. Release is controlled from the decay pot. A headphone output is supplied, as are two 7-pin DIN sockets for interfacing more than one Wasp. The unit weighs about 3 1/2 lbs (1.6 kg). Price is $695.00. AIM Ltd., Box 242, Orange, MA 01364 (U.K. Dist., Rod Argent's Keyboards, 20 Denmark St., London WC2 H8NA, England)." One of the things I find interesting about this little advertisement is the British flag that appears on the Wasp. This flag doesn't appear on the original UK ad in International Musician and Recording World - so it makes me wonder if only Wasps sold in the Americas were lucky enough to have them. A quick Google images search seems to indicate that Wasps with the flag are rare, if not totally non-existent. Even this one photo I found in a MATRIXSYNTH auction post, looks like the original flag was peeled off or replaced or something. Anyone have more info about the flag? 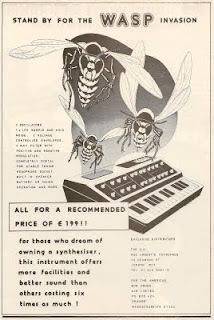 Electronic Dream Plant Ltd. Wasp "Invasion" 1-page advertisement from page 95 in International Musician and Recording World January (UK) 1979. Looking at this "Stand by for the wasp invasion" advertisement always puts a smile on my face. Even when it is August during one of the warmest, driest summers we've had around here in a while. For those not from around these parts - these conditions *always* start to bring out the real wasps when sitting on the deck of your favorite restaurant. But that won't stop my smile because this is one of the earliest EDP Wasp ads - and one of the best. 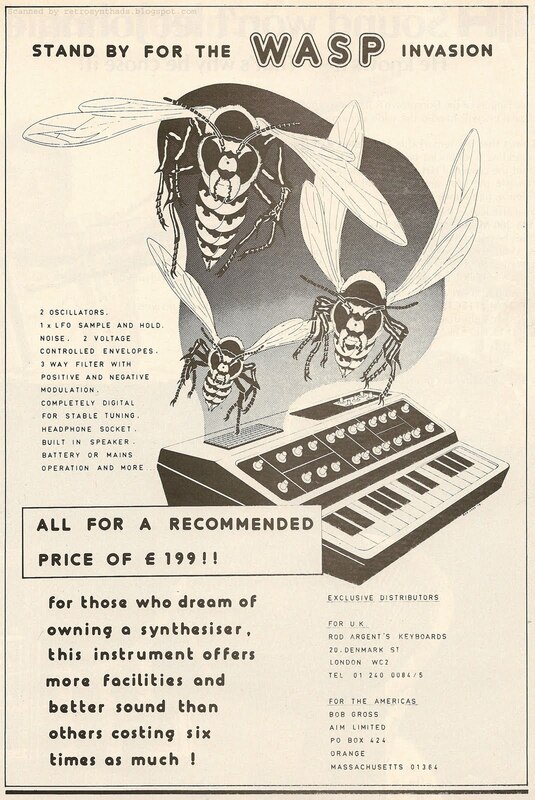 The image of the synth, with the wasps flying out of the speaker is fantastic. 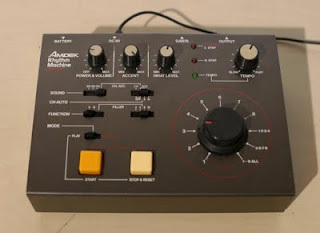 Even the artist's rendition of the simplified front panel with the knobs out of place doesn't bug me. Come to think of it, the casing also looks a lot fatter than Wasps I've seen photos of. There is always the possibility that this image was taken from a prototype (but then again, I like thinking all early ads that have synth photos are prototypes). The ad-copy is simple, but provides a wack of historical reference information including price (199 pounds! ), synth functionality, and even the original exclusive distributors for both the U.K and the Americas. Nice. As far as I can tell, this ad looks to have only have appeared once in IMRW in that January 1979 (UK)/February 1979 (US) issue. Luckily for readers, and not too surprisingly, this issue also contained a "Synthcheck" review of the Wasp. "Once upon a time, there was a little boy called Adrian Wagner, and he lived in a little cottage in Oxfordshire. One day, in between writing vast and complex albums of synthesizer music, he decided to invent a new synthesizer, and after inventing it, he thought of a little company to manufacture it and sell it to all the boys and girls who liked playing synthesizers. He called the company The Electronic Dream Plant Ltd., and he called the synthesizer the Wasp. And here's where the fairy story ends, and the hardware begins because, dreamed up or not, the Wasp synth, designed and developed by Mr. Wagner, rock star of an Oxfordshire parish, represents a very important development in synthesizers indeed." After making three more points during the next two painfully long paragraphs - it's cheap, its portable on-stage, and its portable off-stage - even Robin admits "This has been a strange review so far, in that I've been lavish with praise in a fairly abstract way without actually describing the nuts and bolts of the instrument". Gah. But at least Robin then finally delves into the guts of the synth. Like most reviews, near the end, Robin compares the synth to the Minimoog - "the overall sounds are a little thin" - but notes that its not really a fair comparison considering the difference in prices. And he finally ends the article with the obligatory "if you play keyboards, do go and buy and Wasp. You'll have fun". "Well, I dropped a Wasp out of the fourth floor window of Trident studios into St. Anne's Court one night, without any damage at all to it, and we then, surprised at its survival, backed a Volvo over it. This caused a few knobs to bend, and one to break, but it still worked faultlessly". Not really scientific, but full points for creativity. 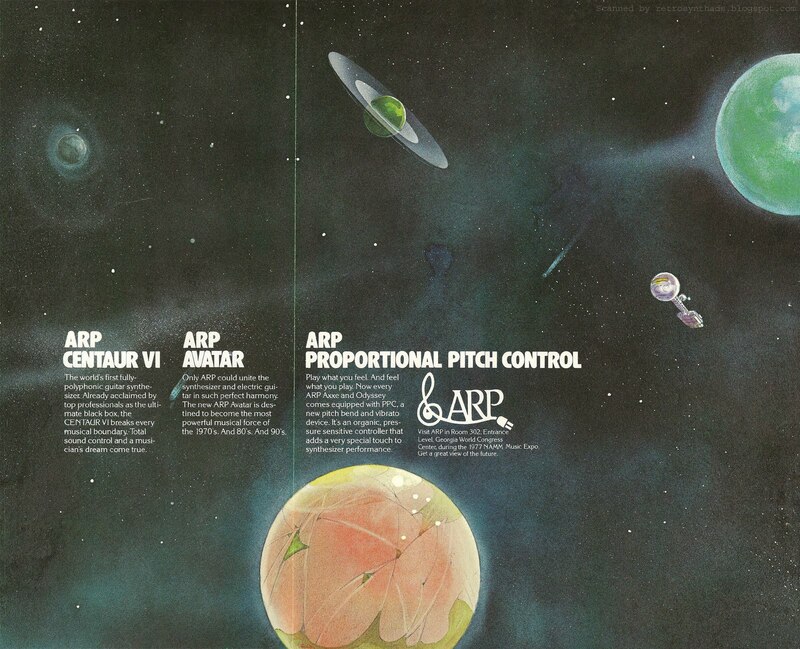 ARP Centaur VI, Avatar, and Proportional Pitch Control NAMM brochure from 1977. What a cool little brochure. 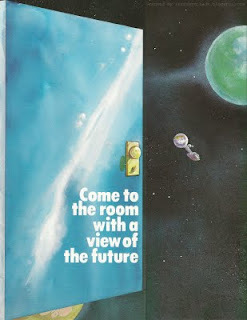 The spacy artwork is fantastic, and that little door flips open so readers can get a really good view the future. I've included a scan with the door closed and another with the door open. The rest of the back of the brochure is just white. I'm guessing this 1977 NAMM brochure was probably handed out during the show to direct visitors to ARP's little piece of synthesizer heaven (ie: room 302). Or, less likely, it was a loose insert in magazines printed shortly before the show? Anyone tell me for sure? In the end, it doesn't matter too much for me - the distribution isn't as important as the brochure-copy written on the other side of that door. It includes information that really helps me put together the chain of events that was occuring at ARP during this time period just a little bit better. The handout focused on three ARP promotions. One of them, unsurprisingly, was their new proportional pitch control (PPC) - which had by now been incorporated into the Axxe and Odyssey. 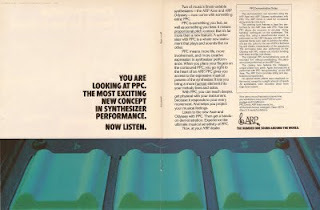 After the NAMM show, dedicated PPC ads started appearing in magazines such as Contemporary Keyboard around September 1977. But, more surprisingly to me, is that this handout features BOTH the Centaur VI AND Avatar. And, it told readers to visit ARP in Room 302, Entrance Level, Georgia World Congress Center to "get a great view of the future". To me, that sounds like both units were available for viewing, and maybe even playing. "ARP Centaur VI - The world's first fully-polyphonic guitar synthesizer. Already acclaimed by top professionals as the ultimate black box, the CENTAUR VI breaks every musical boundary. Total sound control and a musician's dream come true." That's interesting. Because my understanding was that the Centaur VI never made it into production. But, somehow it was "already acclaimed by top professionals as the ultimate black box". It was also my understanding that the ARP Avatar rose from the ashes of the Centaur. But, both are obviously being promoted at the same NAMM show. Time to dig into the time line of these two instruments a bit further. According to the chapter 'The Rise and Fall of ARP Instruments" in the book "Vintage Synthesizers" by Mark Vail, two versions of the polyphonic Centaur were to be developed in parallel - a guitar synthesizer and a keyboard synthesizer. The working prototype included 115 circuit boards, a failure time of approximately 2 hours, and apparently would have retailed for over $15,000 US. Now, here's where I get confused. The way the book tells it, a 1977 business plan written by Friend shelved "a polyphonic keyboard synthesizer under development". The book then goes on in an aside [text written between two square brackets] to say the shelved project was the Centaur. But, then later on in the same aside, it's written that Dave Friend "killed the keyboard version and put all his money on the Centaur". So, it sounded to me like the polyphonic guitar version continued development for a while longer, although at some point it was obviously also shut down. But the book doesn't say how this happened. Instead, the next paragraph goes directly into the story of the continued development of the Avatar, and all the technical problems that continued on with this monophonic guitar synthesizer. Luckily, Sound On Sound comes to the rescue. A Retrozone article that appeared in the April 2002 issue of SOS called "Four in One: ARP Quadra - Part 1", we learn a bit more about the transition from the Centaur to the Avatar. According to this article, the Centaur VI was being developed to include "two polyphonic sections, a dual-oscillator lead synth, a single-oscillator bass synth, and a polyphonic pitch/CV section" for guitar control. But by 1977, the two versions were being developed. The first was the original beast, and then there was also a "simplified keyboard version". It was this simplified keyboard that Dave Friend must have initially canceled. The Centaur VI continued development until ARP realized that it wasn't going to work out (that whole "115 circuit boards/2 hrs to failure/$15,000+ price tag" thing). So "Friend split off some of the Centaur's concepts to develop the Avatar". Aaaah. That makes a bit more sense. Also according to the SOS article, only two prototypes of the Centaur were created. So, does that mean one of those two working prototypes was in that room at NAMM? "I remember when we were first shown the Centaur. David Friend said there was no market for a polyphonic synthesizer over $3,500! The Centauri we showed at the Atlanta NAMM show that year was a six voice machine controlled by a guitar. " He later posts in the same discussion thread that he started working at ARP in the summer of 1975 as a district sales manager, and continued to work there until the last day in 1981. You can read the full discussion thread for more great historical ARP information. "ARP Instruments has announced the unveiling of two guitar synthesizers at the Atlanta NAMM convention in June. On display will be the production prototypes. There is no date yet for their commercial release, but Synapse will let you know more about them as soon as we can." So, from all this history, we can guess that the development of the Centaur VI continued on at least until the Summer of 1977 when shown at Summer NAMM. Plus, the Centaur VI was still alive and kickin' in prototype form long after the ARP Avatar was already well into development, functional, and probably close to launch. Now, back to that marketing hype for a second. The brochure-copy for the ARP Avatar is almost as crazy as that for the Centaur. "Only the ARP Avatar could unite the synthesizer and electric guitar in such perfect harmony. The new ARP Avatar is destined to become the most powerful musical force of the 1970's. And 80's. And 90's." 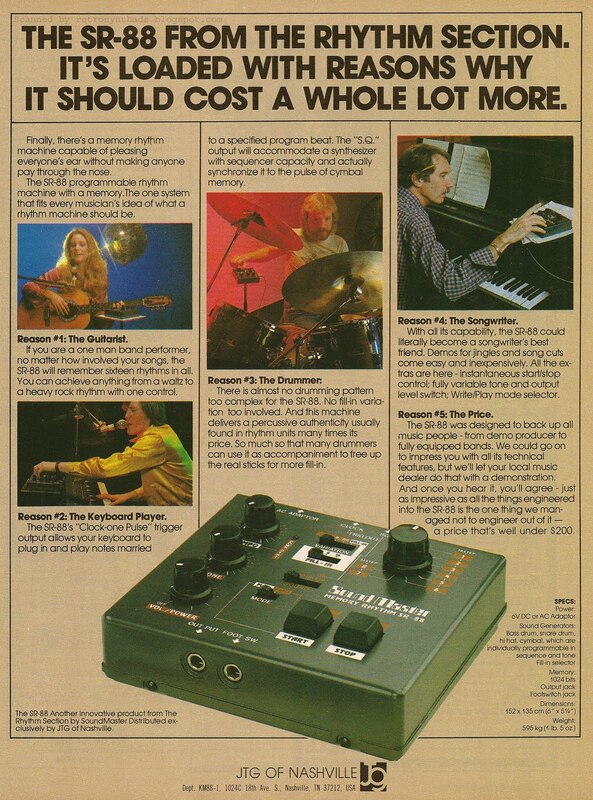 End note: While digging up info online, I came across this fantastic NAMM oral history video with Philip Dodds, past Vice President of ARP, talking about his experience in 1977 (the same year as this brochure!) when "a young director named Steven Spielberg requested that an ARP technician set up a large unit for an upcoming movie". What a great little story to hear directly from Dodds. Definitely check it out if you haven't seen it. Sequential Circuits Inc. Prophet "Two and a half years ago" 1-page advertisement from page 13 in Contemporary Keyboard July 1980. Update: Added to the Sequential Circuits Inc. advertising timeline tool. I've blogged *a lot* about Sequential Circuits Inc.'s Prophets and the Prophet-5 in particular. My Prophet-5 label is up to 12 or 13 at last count, and most include links to a wack of great Prophet resources around the Web. But somehow this ad evaded my blog. I would start, and then while surffin, or noodling around in my studio, get caught up on something else. But, I always knew I would get to it some day. If for only one reason. And that reason starts with another Prophet ad. For a long time I had always thought that this colourful Prophet advertisement was special for two reasons. 1. First Mattos-designed advertisement. Woot! 2. First ad to promote the Rev. 3 Prophet. And I based this claim on the small "addendum" text that appears at the end of the ad-copy during the second ad-run (see that blog post for more details). But, this "Two and a half years ago..." advertisement was actually the one that introduced the world to the new features of the Rev. 3s in July 1980, which included the switch to recently-blogged-about Curtis Electromusic Specialties CEM chips. The ad itself is gorgeous. The black and white up-close-and-personal photo of the Prophet's front panel shows off SCI's characteristic control knobs and buttons to great effect, as well as the small read-out screen. But, I have to admit, my curious mind keeps trying to figure out why SCI chose "32" as the number to show on the screen. I was guessing that the "2" was chosen so that the LED on button "2" would be lit within the photo frame - a nice balance with the lit "Keyboard" button on the left side of the photo. But, why "3" to go along with it? Maybe because it is the Rev. 3 Prophet? The other thing that is really nice about this photo is that it bleeds right to the edges of the page. A lot of ads get framed on the page, with a good centimeter of white space around the edges. But this advertisement was expanded to take up the full page, making that up-close photo look even more impressive. The ad-copy is also fantastic. The way it is lined up on an angle to follow the wood panel in the photo works well, and doesn't impede reading as much as one would think it should. The text really looks like it belongs there. The content of the ad-copy is exactly what you would expect. It starts with a short well-earned pat on the back explaining how SCI had created the first completely programmable polyphonic synth, and then right into a feast of historical references. Yum. I don't think I've seen the variable scaling feature described to such an extent in any other Prophet ad. "JUST INTONATION, Pythagorean, mean tone, and other types of scales are now available. The Prophet enables you to individually tune each note in the scale (C, C#, ...B) and then program that scale into its memory. This allows instant changes from one scale to another (or a given scale can be tuned in different keys, to allow instant modulation in performance). This tuning feature makes the Prophet-5 ideal in educational environments, as well as an excellent tool for experimentation and performance by all musicians. Imagine... a keyboard with thirds that don't beat!" "A new oscillator design, coupled with a unique computer-correction scheme, eliminates tuning problems and periodic internal adjustments. With fewer electronic parts, the new circuitry cuts service problems and dramatically improves the reliability and roadworthiness of the instrument." Not even the Spec Sheet promo, which appeared in the same issue as this advertisement, says as much about these new features. But, it does provide a bit of information not found in the ad, including the all important retail price point! "Revised Prophet-5. The Prophet-5 polyphonic synthesizer has been revised to include the following features: a built-in cassette interface, an A-440 tuning control, voice defeat switches, a new kind of edit mode, and a mode that lets you individually tune each note of the scale to accommodate tunings other than equal temperament. The cassette interface lets the user store program on cassette tapes. The edit mode functions in such a way that turning a knob or hitting a switch will change the sound immediately (previously, you had to hit an edit switch). The voice defeat function is provided for emergency situations where a voice goes out in some way and can't be used. The voice defeat function lets you turn off whatever voice is malfunctioning so you can continue to play the instrument. The tuning feature lets you tune the notes of the scale to different frequencies. the range for each note is about 1/2-semitone from its normal equal-tempered value. These different tunings can be stored in memory (and in cassette tape memory) for later recall. Price is $4,595.00. 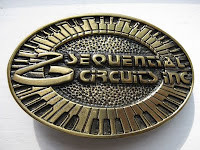 Sequential Circuits, 3051 N. First St., San Jose, CA 95134." As mentioned previously, there's not much more to be said about the Prophet-5 that hasn't been said by all the great Prophet resources out there. Just click on the Prophet-5 label to get started. Now... back to my long weekend at the parent's. My dad is letting me operate the chainsaw to clear some fallen trees at their farm in Saskatchewan.